Rogue One: A Star Wars Story is a 2016 science fiction-fantasy and action film directed by Gareth Edwards. It is the seventh film based on the characters, ideas, and situations first introduced in the 1977 film, Star Wars, written and directed by George Lucas. 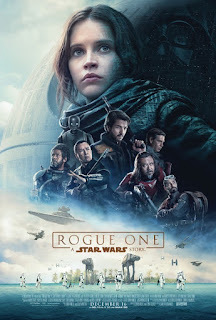 In fact, Rogue One is set immediately before the events depicted in Star Wars and tells the story of a small band of rebels who embark on a mission to steal the plans for the Empire's planet-killing Death Star. Rogue One is set a long time ago in a galaxy far, far away. It opens upon a scene in which a young girl watches her father taken away by Imperial Director Orson Krennic (Ben Mendelsohn), an officer of the evil Galactic Empire. A decade and a half later, that young girl is now the career criminal, Jyn Erso (Felicity Jones). Cassian Andor (Diego Luna), an officer of the Rebel Alliance, the group that seeks to end the tyranny of the Empire, leads a group of rebels that frees Jyn from her current incarceration. Dear reader, I tried not to be too detailed about the plot of Rogue One, although I have summarized the first half-hour or so in great detail above. I just saw the film night before last, and at this point, I think that it is the best Star Wars film since the original trilogy (Star Wars, The Empire Strikes Back, and Return of the Jedi). The first seven films are connected as part of a decades-running narrative, while this eighth movie, Rogue One, is a standalone film. Still, it connects to the original trilogy better and more immediately than the “prequel films” (The Phantom Menace, Attack of the Clones, and Revenge of the Sith) or the recent sequel film, Star Wars: The Force Awakens. I guess that I am saying that Rogue One is the best Star Wars film in over 30 years. It is also the most convincing “war movie” of all the Star Wars films. It is the most realistic looking because many of outside locations look like real places, probably because they were shot on-location. I can safely say that this is the best-looking Star Wars film. The blend of real, computer-generated, and special effects is seamless, with only a few exceptions. It is almost perfect. I only found the first hour or so to be a little clunky, but I understand the need to introduce so many characters, plot lines, and settings as early as possible in a film. Also important: Rogue One is a Star Wars film for our times – for now. It features a multi-ethnic cast of engaging, likable characters, and the lead is a female character who is every bit as capable and as brave and bold as the best male characters. Jyn Erso is a heroine in which we can believe, and even Krennic, the bad guy, is someone audiences can like or even love. My mind bought into the idea that Rogue One takes place just before the original Star Wars. Anyone who has ever seen at least one sequel to the Star Wars of 1977 owes it to themselves to see, Rogue One: A Star Wars Story. The text is copyright © 2017 Leroy Douresseaux. All Rights Reserved. Contact this site for reprint and syndication rights and fees.